Although they look different. 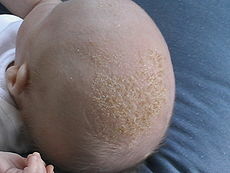 cradle cap and dandruff are really part of the same problem, it's medical term is seborrhea. oil glands in the skin become stimulated by adult hormones. leading to oiliness and flaking of the scalp. this occurs in infants cause of exposure to the mother's hormones and in older children when they begin to make their own adult hormones. the problem also occurs between infancy and puberty, and once a child has the problem, it tends to recur. 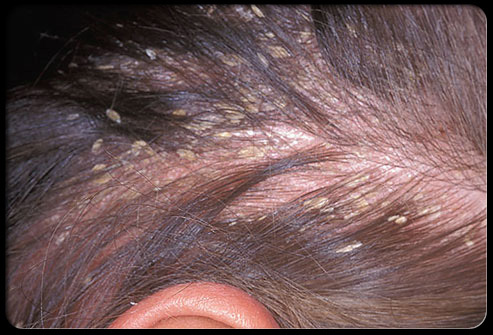 occasionally this condition is mistaken for ringworm of the scalp. careful attention to the conditions listed in the decision chart will usually avoid this confusion. remember also that ringworm would be unusual in the newborn and very young child. another potentially confusing problem is psoriasis. this condition resembles seborrhea somewhat but often stops at the hairline. the scales of psoriasis are on top of raised lesions called PLAQUES, WHICH ISN'T THE CASE IN SEBORRHEA. Many widely available anti-dandruff shampoos are helpful in mild to moderate cases of dandruff. for severe and more stubborn case there are some less well- known but effective over-the-counter shampoos that contains selenium sulfide. selsun (available only in prescription) and selsun blue are examples of such shampoos. over-the-counter preparations, while weaker, are just as good if you apply them more liberally and frequently. cradle cap is best treated with a soft scrub brush. if it is thick, rub in warm baby oil, cover with a warm towel, and soak for 15 minutes. use a fine tooth comb or scrub brush to help remove the scales. then shampoo with sebulex or one of the other preparations listed above. be careful to avoid getting shampoo in the eyes. no matter what you do, the problem will often return, and you may have to repeat the treatment. if the problem gets worse despite home treatment over several weeks, see the doctor. 2 comments for "Home Treatment Dandruff And Cradle Cap"